For the 1963 film, see Lord of the Flies (1963 film). For the 1990 film, see Lord of the Flies (1990 film). For other uses, see Lord of the Flies (disambiguation). 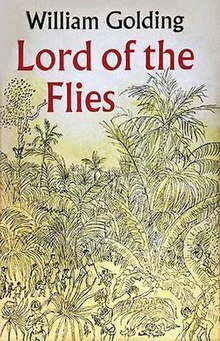 Published in 1954, Lord of the Flies was Golding's first novel. Although it did not have great success after being released—selling fewer than three thousand copies in the United States during 1955 before going out of print—it soon went on to become a best-seller. It has been adapted to film twice in English, in 1963 by Peter Brook and 1990 by Harry Hook, and once in Filipino by Lupita A. Concio (1975). The book takes place in the midst of an unspecified war. Some of the marooned characters are ordinary students, while others arrive as a musical choir under an established leader. With the exception of Sam and Eric and the choirboys, they appear never to have encountered each other before. The book portrays their descent into savagery; left to themselves on a paradisiacal island, far from modern civilization, the well-educated boys regress to a primitive state. Golding wrote his book as a counterpoint to R.M. Ballantyne's youth novel The Coral Island (1858), and included specific references to it, such as the rescuing naval officer's description of the boys' initial attempts at civilised cooperation as "a jolly good show, like the Coral Island". Golding's three central characters—Ralph, Piggy and Jack—have been interpreted as caricatures of Ballantyne's Coral Island protagonists. In the midst of a wartime evacuation, a British aeroplane crashes on or near an isolated island in a remote region of the Pacific Ocean. The only survivors are boys in their middle childhood or preadolescence. Two boys—the fair-haired Ralph and an overweight, bespectacled boy nicknamed "Piggy"—find a conch, which Ralph uses as a horn to convene all the survivors to one area. Ralph is optimistic, believing that grown-ups will come to rescue them but Piggy realises the need to organise: ("put first things first and act proper"). Because Ralph appears responsible for bringing all the survivors together, he immediately commands some authority over the other boys and is quickly elected their "chief". He does not receive the votes of the members of a boys' choir, led by the red-headed Jack Merridew, although he allows the choir boys to form a separate clique of hunters. Ralph establishes three primary policies: to have fun, to survive, and to constantly maintain a smoke signal that could alert passing ships to their presence on the island and thus rescue them. The boys establish a form of democracy by declaring that whoever holds the conch shall also be able to speak at their formal gatherings and receive the attentive silence of the larger group. Jack organises his choir into a hunting party responsible for discovering a food source. Ralph, Jack, and a quiet, dreamy boy named Simon soon form a loose triumvirate of leaders with Ralph as the ultimate authority. Upon inspection of the island, the three determine that it has fruit and wild pigs for food. The boys also use Piggy's glasses to create a fire. Although he is Ralph's only real confidant, Piggy is quickly made into an outcast by his fellow "biguns" (older boys) and becomes an unwilling source of laughs for the other boys while being hated by Jack. Simon, in addition to supervising the project of constructing shelters, feels an instinctive need to protect the "littluns" (younger boys). The semblance of order quickly deteriorates as the majority of the boys turn idle; they give little aid in building shelters, spend their time having fun and begin to develop paranoias about the island. The central paranoia refers to a supposed monster they call the "beast", which they all slowly begin to believe exists on the island. Ralph insists that no such beast exists, but Jack, who has started a power struggle with Ralph, gains a level of control over the group by boldly promising to kill the creature. At one point, Jack summons all of his hunters to hunt down a wild pig, drawing away those assigned to maintain the signal fire. A ship travels by the island, but without the boys' smoke signal to alert the ship's crew, the vessel continues without stopping. Ralph angrily confronts Jack about his failure to maintain the signal; in frustration Jack assaults Piggy, breaking one of the lenses of his glasses. The boys subsequently enjoy their first feast. Angered by the failure of the boys to attract potential rescuers, Ralph considers relinquishing his position as leader, but is persuaded not to do so by Piggy, who both understands Ralph's importance and deeply fears what will become of him should Jack take total control. One night, an aerial battle occurs near the island while the boys sleep, during which a fighter pilot ejects from his plane and dies in the descent. His body drifts down to the island in his parachute; both get tangled in a tree near the top of the mountain. Later on, while Jack continues to scheme against Ralph, the twins Sam and Eric, now assigned to the maintenance of the signal fire, see the corpse of the fighter pilot and his parachute in the dark. Mistaking the corpse for the beast, they run to the cluster of shelters that Ralph and Simon have erected, to warn the others. This unexpected meeting again raises tensions between Jack and Ralph. Shortly thereafter, Jack decides to lead a party to the other side of the island, where a mountain of stones, later called Castle Rock, forms a place where he claims the beast resides. Only Ralph and a quiet suspicious boy, Roger, Jack's closest supporter, agree to go; Ralph turns back shortly before the other two boys but eventually all three see the parachutist, whose head rises via the wind. They then flee, now believing the beast is truly real. When they arrive at the shelters, Jack calls an assembly and tries to turn the others against Ralph, asking them to remove Ralph from his position. Receiving no support, Jack storms off alone to form his own tribe. Roger immediately sneaks off to join Jack, and slowly an increasing number of older boys abandon Ralph to join Jack's tribe. Jack's tribe continues to lure recruits from the main group by promising feasts of cooked pig. The members begin to paint their faces and enact bizarre rites, including sacrifices to the beast. One night, Ralph and Piggy decide to go to one of Jack's feasts. Ralph secretly confronts Sam and Eric, who warn him that Jack and Roger hate him and that Roger has sharpened a stick at both ends, implying the tribe intends to hunt him like a pig and behead him. The following morning, Jack orders his tribe to begin a hunt for Ralph. Jack's savages set fire to the forest while Ralph desperately weighs his options for survival. Following a long chase, most of the island is consumed in flames. With the hunters closely behind him, Ralph trips and falls. He looks up at a uniformed adult—a British naval officer whose party has landed from a passing cruiser to investigate the fire. Ralph bursts into tears over the death of Piggy and the "end of innocence". Jack and the other boys, filthy and unkempt, also revert to their true ages and erupt into sobs. The officer expresses his disappointment at seeing British boys exhibiting such feral, warlike behaviour before turning to stare awkwardly at his own warship. In February 1960, Floyd C. Gale of Galaxy Science Fiction rated Lord of the Flies five stars out of five, stating that "Golding paints a truly terrifying picture of the decay of a minuscule society ... Well on its way to becoming a modern classic". Its stances on the already controversial subjects of human nature and individual welfare versus the common good earned it position 68 on the American Library Association's list of the 100 most frequently challenged books of 1900–1999. It was awarded a place on both lists of Modern Library 100 Best Novels, reaching number 41 on the editor's list, and 25 on the reader's list. In 2003, the novel was listed at number 70 on the BBC's survey The Big Read. In 2005, the novel was chosen by TIME magazine as one of the 100 best English-language novels from 1923 to 2005. A fourth adaptation, to feature an all-female cast, was announced by Warner Bros. in August 2017. Scott McGehee and David Siegel are slated to write and direct. The film's concept has been negatively received, with some stating that an all-female cast goes against the novel's themes of masculinity and male power. Nigel Williams adapted the text for the stage. It was debuted by the Royal Shakespeare Company in July 1996. The Pilot Theatre Company has toured it extensively in the United Kingdom and elsewhere. In October 2014 it was announced that the 2011 production of Lord of the Flies would return to conclude the 2015 season at the Regent's Park Open Air Theatre ahead of a major UK tour. The production was to be directed by the Artistic Director Timothy Sheader who won the 2014 Whatsonstage.com Awards Best Play Revival for To Kill A Mockingbird. In June 2013, BBC Radio 4 Extra broadcast a dramatisation by Judith Adams in four 30-minute episodes directed by Sasha Yevtushenko. The cast included Ruth Wilson as "The Narrator", Finn Bennett as "Ralph", Richard Linnel as "Jack", Caspar Hilton-Hilley as "Piggy" and Jack Caine as "Simon". Many writers have borrowed plot elements from Lord of the Flies. By the early 1960s, it was required reading in many schools and colleges. Stephen King's fictional town of Castle Rock, inspired by the fictional mountain fort of the same name in Lord of the Flies, in turn inspired the name of Rob Reiner's production company, Castle Rock Entertainment, which produced the film Lord of the Flies (1990). Stephen King got the name Castle Rock from the fictional mountain fort of the same name in Lord of the Flies and used the name to refer to a fictional town that has appeared in a number of his novels. The book itself appears prominently in his novels Hearts in Atlantis (1999), Misery (1987), and Cujo (1981). Stephen King wrote an introduction for a new edition of Lord of the Flies (2011) to mark the centenary of William Golding's birth in 2011. The novel Garden Lakes by Jaime Clarke is an homage to Lord of the Flies. The final song on U2's debut album Boy (1980) takes its title, "Shadows and Tall Trees", from Chapter 7 in the book. Iron Maiden wrote a song inspired by the book, included in their 1995 album The X Factor. The Blues Traveler song "Justify the Thrill," included on the 1997 album "Straight on Till Morning," makes reference to the Lord of the Flies in the lyrics: "The pig's head on a stick does grin / As we teeter on the brink / He's singing you are all my children / My island's bigger than you think." ^ "Bound books – a set on Flickr". Archived from the original on 25 October 2014. Retrieved 10 September 2012. ^ Weiskel, Portia Williams, ed. (2010). "Peter Edgerly Firchow Examines the Implausible Beginning and Ending of Lord of the Flies". William Golding's Lord of the Flies. Bloom's Guides. Infobase. ISBN 9781438135397. ^ Baker, James Rupert; Ziegler, Arthur P., eds. (1983). William Golding's Lord of the Flies. Penguin. p. xxi. ^ Rosenfield, Claire (1990). "Men of a Smaller Growth: A Psychological Analysis of William Golding's Lord of the Flies". Contemporary Literary Criticism. 58. Detroit, MI: Gale Research. pp. 93–101. ^ Gale, Floyd C. (February 1960). "Galaxy's 5 Star Shelf". Galaxy Science Fiction. pp. 164–168. ^ "100 most frequently challenged books: 1990–1999". American Library Association. 2009. Archived from the original on 15 May 2010. Retrieved 16 August 2009. ^ "The Big Read – Top 100 Books". BBC. April 2003. Archived from the original on 28 October 2012. Retrieved 18 October 2012. ^ Grossman, Lev; Lacayo, Richard (6 October 2005). "ALL-TIME 100 Novels. Lord of the Flies (1955), by William Golding". Time. ISSN 0040-781X. Archived from the original on 10 December 2012. Retrieved 10 December 2012. ^ Fleming, Mike, Jr (30 August 2017). "Scott McGehee & David Siegel Plan Female-Centric 'Lord Of The Flies' At Warner Bros". Deadline. Archived from the original on 6 March 2018. Retrieved 11 April 2018. ^ France, Lisa Respers (1 September 2017). "'Lord of the Flies' all-girl remake sparks backlash". Entertainment. CNN. Archived from the original on 7 November 2017. Retrieved 11 April 2018. ^ CNN, Lisa Respers France. "'Lord of the Flies' all-girl remake sparks backlash". CNN. Retrieved 21 February 2019. ^ "William Golding – Lord of the Flies". BBC Radio 4. Archived from the original on 20 June 2013. ^ Ojalvo, Holly Epstein; Doyne, Shannon (5 August 2010). "Teaching 'The Lord of the Flies' With The New York Times". nytimes.com. Archived from the original on 8 January 2018. Retrieved 6 May 2018. ^ a b King, Stephen (2011). "Introduction by Stephen King". Faber and Faber. Archived from the original on 24 July 2012. Retrieved 12 October 2011. ^ Beahm, George (1992). The Stephen King story (Revised ed.). Kansas City: Andrews and McMeel. p. 120. ISBN 0-8362-8004-0. Castle Rock, which King in turn had got from Golding's Lord of the Flies. ^ Liukkonen, Petri. "Stephen King". Books and Writers (kirjasto.sci.fi). Finland: Kuusankoski Public Library. Archived from the original on 23 March 2007. ^ Bailie, Stuart (13 June 1992). "Rock and Roll Should Be This Big!". NME. UK. Archived from the original on 23 December 2007. Retrieved 28 November 2007. ^ "CALA (-) LAND". ilcala.blogspot.com. Archived from the original on 13 October 2016. Retrieved 6 May 2018. ^ ""Justify the Thrill" at Google Play Music". ^ Cohen, David (2006). The Simpsons The Complete Ninth Season DVD commentary for 'Das Bus' (DVD). 20th Century Fox. Golding, William (1958) . Lord of the Flies (Print ed.). Boston: Faber & Faber. This page was last edited on 25 April 2019, at 06:12 (UTC).